Time is a scarce resource. We can’t seem to find enough of it, and most of us are heavily overcommitted. Squeezing in one more thing is nearly impossible, and usually quite counterproductive. We frequently come across things that we know are good for us, and will make our lives better, yet we have trouble making the time and committing to them. When it comes to getting mindful and practicing meditation, making the time in our busy schedules is well worth the effort though — especially since mindfulness helps us be more efficient and use our time better overall. Happily, making space in our life for being mindful and meditation is easier to do than we might initially think. There are many quick, easy to access, and versatile mindfulness practices you can add to your tool belt for use even when you have the tightest of schedules. For really jammed schedules, taking your meditation practice with you wherever you go is a huge help. So, how do you take meditation with you? As I mentioned briefly in Step up your mindful game with meditation techniques, try an on-the-go walking meditation. This is a great mindfulness exercise to incorporate into every day life, particularly every day busy life. 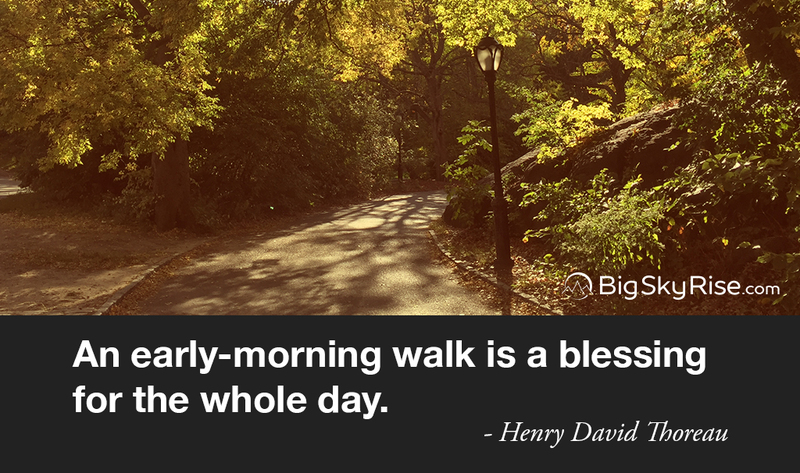 It’s great when you’re walking to or from work, when you’re walking from your desk to the water cooler, when you’re out grabbing the mail, or are just taking a few steps inside your house. I do a number of different walking meditations and they all have some wonderful aspects to them, especially since they can more deeply connect our mindfulness practice to our daily activities. Lost in a swirl of thoughts and emotions? Take a look at this very short article on the Huffington Post by Amanda Schupak. In it, she shares a useful and effective two minute trick to calm a racing mind. Utilizing the power of the breath and mindfulness, it is a good exercise for bringing yourself back out of the mental whirlwind we often get pulled into. Of particular note, this exercise is a good one to keep in mind during higher stress and emotionally turbulent times. This is a nice little practice which touches on a topic that I’ll explore here more on BigSkyRise in the next year or so. Essentially, it is a powerful, short, and simple practice to mindfully appreciate the life we already have around and within us. Doing this exercise during the spring months is especially pleasant as we can watch the world awakening and the energy of life springing forth. Check out this five minute spring awakening practice. Observing the energy of life, the color of the world, and the simple delicacy of subtle changes taking place on a daily basis can be a powerful medicine. For deep-seated emotional struggles, the results of this practice may not be seen for a while, though the long term effects can still be significant. Important: If you are suffering from depression and prolonged sadness, please, reach out to someone, get some help. There are solutions, you are not alone, many more people care about you than you might realize, you deserve happiness, and life is worth the struggle. These mini practices are powerful and can be integrated into modern life fairly seamlessly when there is a willingness to do so. There are also many more of these types of exercises out there, and of course, that’s one of the things the BigSkyRise : Newsletter gives you. So, if you haven’t already, sign up now to get even more quick and easy mindfulness exercises. Finding time in our busy lives to do the many things we want and need to do is tough. Practicing mindfulness and meditation is something with such profound benefits that it is worth working a consistent practice into your life. Luckily, there are many very short practices that can be of tremendous benefit that are also quick and easy to do. If you like these, sign up to the BigSkyRise : Newsletter to get more quick and easy mindfulness exercises on an on-going basis. Just like last week, this week’s post and the next few upcoming articles are part of a content curation series aimed at giving you hand-selected articles from around the web. While the content is primarily coming from outside of BigSkyRise, there is a hidden theme behind the articles I’m sharing. Additionally, these articles will help you empower yourself to a greater extent when we dive into some new, exciting content I’ll be releasing soon. So, I hope you enjoy, and please let me know your thoughts. BigSkyRise exists to make lives better. Please share, and thank you!